When you receive the latest issue of History News magazine in the mail, you’ll probably notice some changes. Some are aesthetic, like a newly redesigned masthead and a more streamlined layout that gives our articles greater visual impact. Other changes are structural, like the addition of new columns and voices that emphasize AASLH’s strategic goals and highest values. This isn’t the first time the magazine has been reinvented, of course. When you’ve been publishing since 1941, some things are bound to change over time. What started out as a modest eight-page bimonthly newsletter of AASLH and member activities has grown into a 40+ page space where public historians from around the country share their research, experiments, techniques, and lessons learned as they work to interpret state and local history in relevant and meaningful ways. Although “Shop Talk” focused on pressing issues of the day like mimeographing newsletters and recording oral histories of Civil War veterans, it also echoes timeless concerns like increasing museum membership and constructing exhibits on a budget. Perusing these vintage issues reminds us that although both the field and the world have greatly changed since then, we as public historians build our future on a firm foundation of community, the open exchange of ideas, and a willingness to try new things to reach our goals. 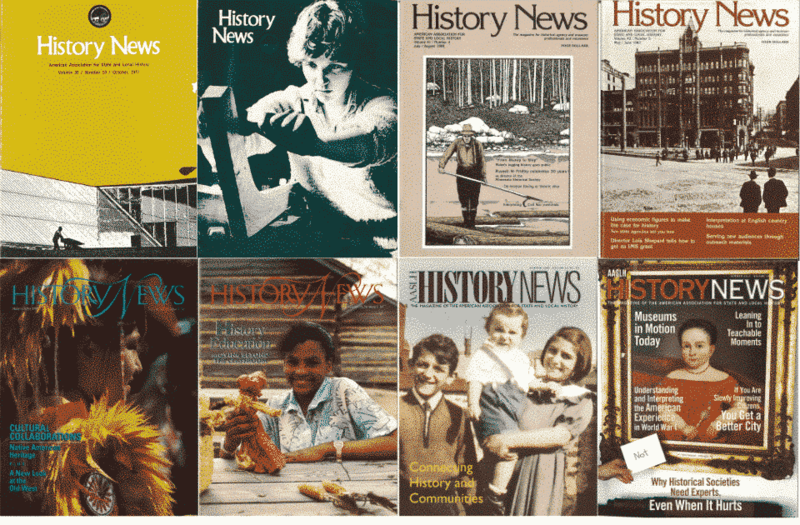 With a fresh editorial vision, we at History News are focusing on amplifying diverse voices and experiences while connecting field-wide conversations to the needs of local institutions. New sections in the magazine will spotlight people sharing history in unexpected ways, while our content will continue to respond to the issues of history relevance and equity that unite our members. Moving forward, our overarching goal is to make the magazine an inclusive space where history practitioners of varied backgrounds, roles, perspectives, locations, and beliefs find themselves represented, challenged, and inspired. We hope you’ll join in as we discuss and debate our field’s big issues and concerns, and we hope to be your meeting place for questions and answers for another seventy-eight years and beyond. Members can read the new issue online for free before it hits mailboxes. Find it in the Resource Center. Have an idea for an article or leaflet? Let’s brainstorm. Glad to see the ongoing evolution of History News to meet the changing needs of the field. And boy, you know you’ve been around a long time when you recognize the covers of History News in the blog post (Shop Talk, however, definitely precedes me by several decades). When my life crashes into change, I am prompted to think about [BOLD]preserving the heritage[bold] of, or forgetting, whatever has been ‘new & improved.’ In the case of journals for example, professional museum organisations with which I am familiar used to provide subject & author indexes [remember those?] for their magazines–some annual & others by decade [the latter more time & effort-efficient for me to use than the annuals]. My awareness may be limited, but museum/heritage journals no longer provide access to to content by subject or author indexes. I can generally recall what I have read in these professional journals & often wish to go back to find the articles on my personal collection of the hard copy sources [remember those?]. May I recommend to all professional museum/heritage journal publishers that serving the access needs of those of us who have saved the hard copies of back issues. Personally, I don’t need 1+ million subject hits from a Google search. I need an effective tool to find subjects limited to the journal on my shelf that I read years ago & now can’t recall the author’s name, nor date. RECOMMENDATION # 1: Please consider indexing all History News back issues for those of us who have shelf-loads of paper magazines. RECOMMENDATION # 2: I believe I recall one professional museum/heritage journal that used an anniversary to carry out a serious in-depth review of changes in the content. In this light, it would be of interest to me at least to get access to a history of the thinking & theories portrayed in Museum News. Thanks for thinking about this. Max is right. It’s a welcome evolution, and I do recognize some of the covers. The good thing is that there is a long tradition of quality, the technical leaflets being an example, including the recent one.